Last week, we spoke with the CEO and founder of Biotricity, Waqaas Al-Siddiq, about physician concerns due to a lack of clear delineation between medical grade vs fitness/lifestyle devices. In Part 2 of my discussion with Al-Siddiq, we explore some of the trends and market evolutions that will affect the wearable device industry in the next five years. We delved into the future of device design , new therapeutic applications, how the Internet of Things (IoT) will enhance the usability and effectiveness of wearables, consumer and patient confusion related to data overload, and what role the FDA and other regulatory bodies may play moving forward. Medical Device Online: What are the latest design trends for medical device wearables? Waqaas Al-Siddiq: There is a lot of thought going into device designs that appear to be jewelry. They are becoming more stylish, tools that can be utilized as if no one is aware that you are wearing it. An example would be bracelet-oriented fitness trackers for females, like the Misfit. Then you have a trend in tattoos and other items meant to be very close to, or even integrated with the individual’s body at very specific locations. So now, the ergonomics and the styling are not as important as making extremely close contact with your skin or another body part. For example, Google and Novartis are working on contact lenses that monitor your blood sugar; devices like this can be put in and pulled out. Dexcom has a continuous glucose monitor with a tiny sensor that pierces your skin. It is minimally invasive and uses a small transmitter to send data to your phone or device. So, in addition to actual medical devices, made specifically for healthcare by medical device companies, you have the movement towards style, and something that is not noticeable, which is a focus of companies producing healthy living wearables for consumers. What we haven’t seen, so far, is something that is seamless but also accurate, but technology is always evolving. MDO: What untapped therapeutic areas remain that could be targeted by wearables in the future? 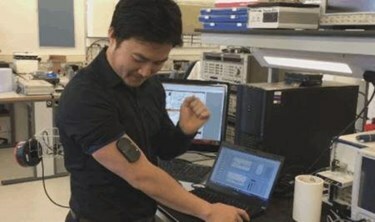 Al-Siddiq: A few areas that companies are looking into now are pain management, things connected to drug delivery, and wearables that are incorporated with drugs. Zoll Medical has a built-in defibrillator and ECG monitor - if the device detects something wrong it can deliver a shock to your chest, combining the therapy with the wearable. From the world of massage therapy, you have wearable electrodes that stimulate the muscles. There are some wearable neural devices, which can be slightly invasive, that deliver a shock or a therapy to the brain. There is going to be a lot more of these combinations and more integration with your body, as well as the advanced drug delivery component. MDO: How do you think the Internet of Things (IoT) will transform wearables? Al-Siddiq: The IoT will be a key component for being able to do advanced things with drug delivery. A connected device can transmit information real-time, which can then be interpreted (by a physician), and then pushed back to that device to deliver a needed dosage. So this device actually becomes intelligent. The other aspect is that devices are able to offload data. It is going to enable unprecedented feedback. The company who is manufacturing the product can also use this data for post market product evaluations. Furthermore, consider if someone has a heart attack: caregivers may not know the exact cardio issue, or what type of medication the patient might be taking. If the patient has a device that can detect the event and transmit all of that patient’s relevant medical history, doctors’ ability to provide care is accelerated in a hospital scenario. This same device capability can help doctors and EMTs to know right away whether a patient has had adverse reactions to particular medications or treatments in the past. As a manufacturer, access to data from an implantable or a wearable device can help you to improve upon the technology; The device itself is giving data on how effectively it is working or being utilized. These are the main two areas the IoT will impact: real-time decision making for the individual, on an ongoing basis for emergency and disease management, and manufacturer feedback. MDO: Can these devices provide too much information, leading a patient to make an inaccurate self-diagnosis and, subsequently, a poor health choice? Al-Siddiq: Absolutely, but medical wearables can also drive patient compliance by providing them with a feedback loop. It doesn’t only drive compliance; it enables them to manage their disease. The classic example is the diabetic who uses the glucometer to make a decision every day by pricking his or her finger. The flip side - too much data - may confuse patients, and this is where you have to strike a balance. We are careful to simplify when we deliver this type of information. The average consumer cannot read an ECG, so showing them their ECG has little to no value, and maybe it even scares them, if they have some concept of what an ECG is, and they look at their own reading and it differs from what they expect. Device makers need to deliver information that is easily consumed. We deliver this information using the concept of age. Instead of giving someone an ECG and putting in all the details, we say, “look, you are 40 years old and your heart is 45.” The majority of people can quickly understand that. Telling you that your ECG is five percent off from a variability perspective means nothing to you. But, if after additional monitoring, we share that your heart is now 44, you can understand that your heart now is twelve months healthier than it was before. It is still four years too old, but we can gauge the positive change in comprehendible terms. MDO: Will FDA become more involved, regulating these devices more closely? Al-Siddiq: They are certainly looking at it, and there is going to be a rude awakening. The FDA is going to get a lot more aggressive. To this point, no product has really experienced a negative (clinical) effect, and consumer wearable marketing has not targeted at-risk patients. If these types of wearables start to claim that they are healthcare relevant or that they are creating viable healthcare data - but they are not FDA cleared - that is when the FDA will step in. For example, there is a company that put a sensor on top of an inhaler, which measures how often it is used. The company claims that the number of times a patient uses the inhaler is directly indicative of the severity of that patient’s condition (i.e., it is a bad ‘breathing’ day, a moderate day, or a normal day). That is fine information, but the inhaler is not a medically cleared device and its data analysis cannot claim to be demonstrative of clinical fact. It could be correct, but FDA requires that you benchmark that information. Another example is the Samsung watch, which had a symbol - a picture of a heart, inside which was pictured ECG waves. That is completely misleading, because you can’t get ECG on a watch unless it has the ability to complete the circuit. You need two points across your heart, so you have to touch your other hand to the watch to actually get an ECG, and that device doesn’t have the required technology. Rather, the watch has a sensor that tracks blood flow in the skin, which is not as accurate, and thus could be misleading to the consumer. It also is a matter of perception. If someone has a heart condition and they want to track it for themselves, they may purchase one of these watches. It shows them a heartrate symbol, but they don’t understand the technical details, so from the FDA’s perspective, the marketing has accidentally misled them. That is going to change. Regulatory bodies are going to better define for consumers those devices that are intended for fitness/wellness versus those that are medical grade.